Kona's Paddy Wagon has been around for a while and I reckon the current version is the best looking one yet with its beautifully understated paint job. Ever since it came out (in 2004 if I remember correctly), I've wanted to get my hands one. Why? Because in my opinion the Paddy Wagon is one of the few sensible off-the-peg singlespeed/fixed bike packages you can get: 42 x 16 gearing (that's 70.1" on 28s) that'll get you up hills even if you're not endowed with Cancellara-like thighs, and clearance for 28mm tyres and mudguards. Like. It's not just sensible, it's also pretty dependable. It's made from steel, and although you won't be very impressed by its weight when you pick it up, you will be by the ride quality that Kona cromoly butted provides. Super-strong wheels, Kona own brand hubs laced to TunnelTop rims, have withstood everything I've thrown at them. The bike tracks beautifully, you can really chuck it around corners. If you're running it fixed, be careful of pedal strike, it's so happy cornering that even its high bottom bracket won't necessarily keep you out of trouble. Although the spec on the Kona website lists Continental Ultrasports - which I don't rate - to go on those TunnelTops, the test bike came with Maxxis Detonators which in my opinion are much better. They stick well, and have so far withstood visitations from the puncture fairy. 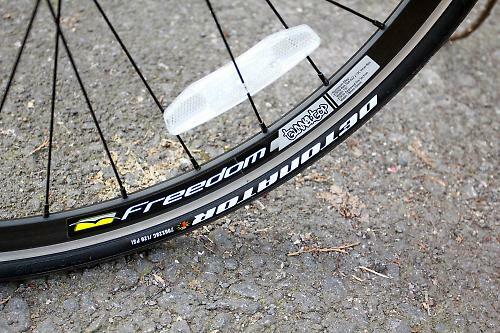 Worth putting on the shortlist if you're shopping for a fast commuter, audax or winter trainer tyre. Both hubs are attached with tracknuts, which is good, but they are going decidedly rusty, which is not so good. The rear is a flip-flop hub with a 16 tooth freewheel on one side and a fixed cog on the other, also 16 tooth. Flipping the hub is easy with rear facing dropouts. There are braze-ons for mudguards on the frame and forks and as mentioned above there's plenty of clearance for them too. If you're planning on fitting mudguards, bear in mind you'll need some space for the wheel to come out. SKS secu clips are good solution to this problem. Braze-ons for a rack would have been a bonus, but I suppose you have to stop somewhere. Talking about braze-ons, there are bosses for 2 bottle cages. There are no pump pegs, but if you like yer frame pump, a Zefal number 2 fits securely in front of the seat tube. The track nuts keep hold of the rear wheel as well as any other fixed bike I've ridden: it's worth tightening the chain up every 100 miles or so if you like it just so. Part of the problem is likely to be that the drivetrain is not the sturdier and harder wearing 1/8" width, but rather the more widely available 3/32". Easily swapped out when worn out. The front end of the drivetrain is an FSA Tempo chainset with a 42T chainring. The cranks are 170mm which is a bit shorter than most will be used to. Shorter cranks really help you spin the bike down long descents when running the bike in fixed mode. Like. My main gripe with the bike is the braking. 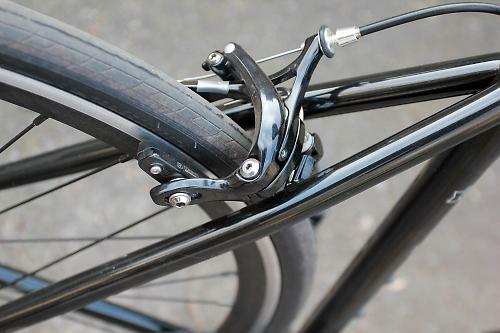 If you're riding in fixed mode, great brakes are actually a bit of a disadvantage in my opinion. Because you've effectively got 2 back brakes (assuming you run 2 brakes on your fixer) it's much too easy to lock up the back wheel. So in this respect I suppose the Tektro units fitted are pretty good. Riding single though, I wouldn't have minded something a bit less spongy and more grippy. I suspect swapping the brake blocks out will sort out at least some of this. On longer rides I noticed that shock absorbing properties of the frame were not quite matched in the cockpit. I can't put my finger on whether it's the bars, the stem or the straight steel Kona retro road forks - probably a combination of the three - but I felt bumps coming through the cockpit a bit harsher than I would have liked. I found the saddle OK, but prefer my Brooks. Of course all bottoms are not the same so it may be just fine for you. The best thing about the Kona Paddy Wagon is that nothing stands out. It quietly gets on with the job, gets you to where you're going with no complaints Shop around and you can find it well below list price too - we found one for £380. What more do you want from a bike? Kona says: Our singlespeed/fixie cult classic continues to be cherished amongst downtown traditionalists looking for a bike that blends performance and style like a finely minted cappuccino. The same classic steel frame with Tunnel Top rims and a flip-flop rear hub with standard road drop bars for urban efficiency. Custom everything and a cherry black paint job with silver trimmings make this the most stylish Paddy Wagon to date. 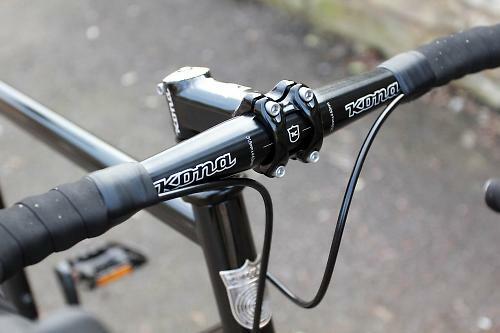 The usual Kona build quality, really nicely made. The frame is made from Kona's own Cromoly butted. The geometry is fast commuter / winter trainer, not really a full on racer. Definitely not track geometry. The bike was slightly short in the top tube, but that's actually quite nice on this kind of bike. The stem fitted is fairly short, so it's really easy to lengthen out the cockpit if you wanted to. The bike overall was pretty comfortable, the frame is great. The combination of bars, stem and fork transfer road shocks a bit too readily for my liking. Bearing in mind that this is not a race bike, it's plenty stiff enough. Yep, if you kick, you go faster! No toe overlap, even with mudguards fitted. I absolutely loved the handling of the bike. It tracks really nicely around corners. It'll definitely get you going around corners faster. I couldn't quite put my finger on whether it's the stem, the bars or the forks that are responsible for transferring a bit of road shock. I reckon fitting some gel padding under the bar tape would sort it. I would say there's scope for fitting a stiffer wheelset. I wouldn't recommend forking out for this until they're worn out though. I suppose you could fit faster tyres. But you'd probably get more punctures. I think the efficiency is fine. Seeing as it's not built for sprinting, it works pretty well. It's not the lightest bike I've ever tried, having said that, it climbs pretty well. Neither the cog or the chainwheel are particularly round. I wouldn't expect them to be at this price point. I'd say the drivetrain is fairly basic as fixed drivetrains go. A Campag Record Pista would blow the chainset out of the water, but that would also be a third of the price of the bike. It's not particularly round and if you want your chain perfectly tight you might get frustrated. Fine for actual riding though. Neither wheels nor tyres are massively light, but I'd prefer them to be strong rather than light. Which they are. I haven't ridden the bike long enough to really assess durability, but from what I've seen I'd expect these wheels to last a long time. Especially if you look after the bearings. I absolutely loved the Maxxis Detonator tyres. Really grippy and no punctures. I thought the brakes were a bit spongy. Swapping out the pads should sort this out. One gear. Not much to go wrong / wear out really. As I mentioned above, I think the brakes could be better. This is more important if you ride single than if you ride fixed in my opinion. Kona messed around with the geometry of the Paddy Wagon this year, and as a result the chainstay length is not compatible with the chain length and the 42t/16t ratios. 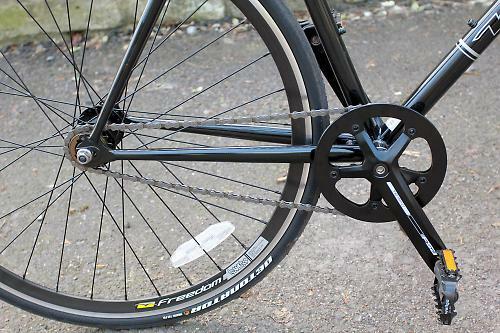 Chain tension is impossible to get right as either the chain is too loose (runs out of horizontal drop-out), or too tight (shortening the chain by one section), and you cannot take the back wheel off. Flawed designed and potentially life-threatening problem as my chain almost came off riding fixed. Kona have been informed, but so far have refused to acknowledge problem - should be a recall. Buy with risk..
half link chain or a simple half link in your existing chain would set you right aloadofpants surely? Half-link chain is how to do it, unfortunately Kona should have done this as standard OR at least recall the bikes to swap the chains out at their expense, not mine.. Even this review states that it is not possible to tighten the chain! Mmmm....not too sure what to say to this review or the comments above, considering that the bike being tested is a 2011 model but my 2009 model has it's issues but none of them I would suggest affect safety or the ability to ride it hard. OK the brakes could be better but by the simple expedient of replacing the brake blocks with Swiss Stop Flash Pro (black) and stripping out the brake cables before lubing up the brake sleeves resolved nearly all the brake lag issues. OK the drive train could be better though after over 3k miles running this beastie around the Chilterns and commuting between the Chilterns & Northolt (40 mile round trip) and the occasional trip from the Chilterns to Greenwich it's been fine. The Dicta freewheel is rather cheap and nasty but once replaced with a Shimano SF-MX30 16T freewheel (after >2k miles) not a crunch heard (while going up some of the steep hills where I live). As for the issue of tightening the chain, well it can be a bit of a bother after a puncture away from the workshop at home but not impossible to get it "bar tight" if you want, with the application of a bit of elbow grease. 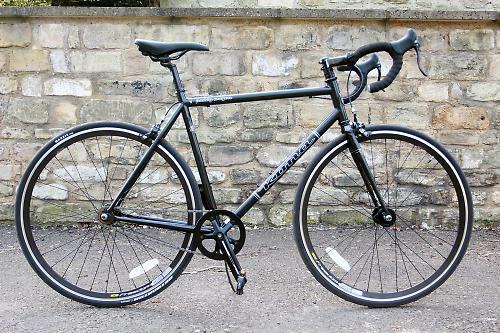 Now the ride you have described is accurate especially at speed on cruddy roads around the Chilterns or in London though to be honest with a stiff steel alloy framed single speeder as this is, is it not surprising, but the handling of this bike is exceptional because of it. While the wheel base is slightly longer than the other Kona's that I have or have ridden, it does make the power transfer from your legs equate to both excellent acceleration (>30mph), a cruising speed (around 17-20mph) and quite a good hill climbing ability. The wheels on the 2009 model seem to be pretty similar to the 2011 by the sound of it but they need to be stronger rather than lighter as you alluded to but they do suffer with the same problem that many Kona wheels have, they do need to be introduced to a wheel trueing jig to get them spot on true which is the same for the dishing. The Continental Ultra Sport's are great all round tyres though these too need a little help in the puncture protection area - which is resolved with Panaracer FlatAway aramid liners, then you really are ready to ride it anyway you like. So overall it is a great bike to ride and ride like a loon if you want to (once you have modified/adjusted the brakes) and at the price it was it is a smasher - yes there may be better bikes but you do have to spend a good few more pennies to get one.